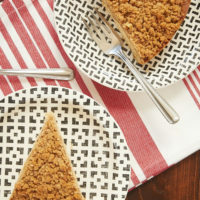 There’s big flavor in this simple Toffee Pecan Brown Butter Crumb Cake! Nutty brown butter, sweet toffee, crunchy pecans, and a hint of cinnamon combine for a tasty anytime cake. My weakness for brown butter anything is very well documented here at BoB. That rich, nutty flavor is tough to beat. 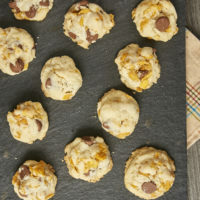 It’s such a simple way to add a flavor boost to baked goods that I find myself integrating it into recipes more and more. 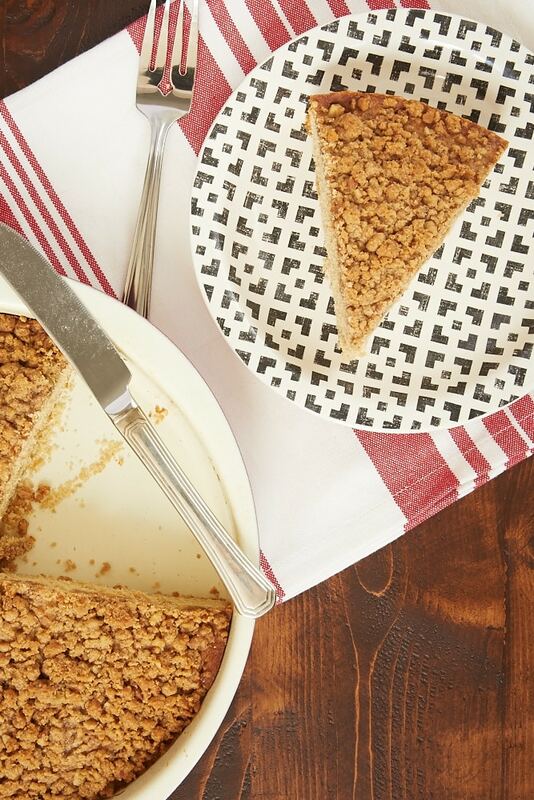 For this simple Toffee Pecan Brown Butter Crumb Cake, I took my love of brown butter and added in some more really great flavors. As is often the case with crumb cakes, there’s cinnamon in both the cake and the crumb topping. 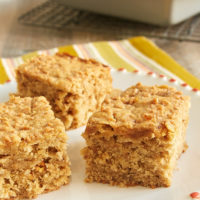 Plus, that buttery crumb has plenty of pecans and toffee as well. All of that comes together for one of our favorite cakes! If you’ve never tried browning butter, don’t fret that it’s too difficult. It’s a really simple process. All you’ll need is a saucepan or a skillet and some butter. That’s it. The rest more or less takes care of itself. The butter will melt, bubble a bit, and, after a few minutes, form browned bits in the bottom of the pan. And then you’re done! Just don’t wander off so you won’t accidentally let it burn. Your reward for taking the few minutes to brown the butter will be this absolutely lovely cake! 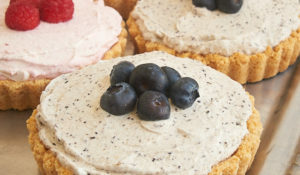 I’m just so smitten with every flavorful bite of this cake. I love that it’s such a great anytime cake that doesn’t need a special occasion. Serve it for brunch, a sweet afternoon snack, or dessert. Just do yourself a favor and serve it often! 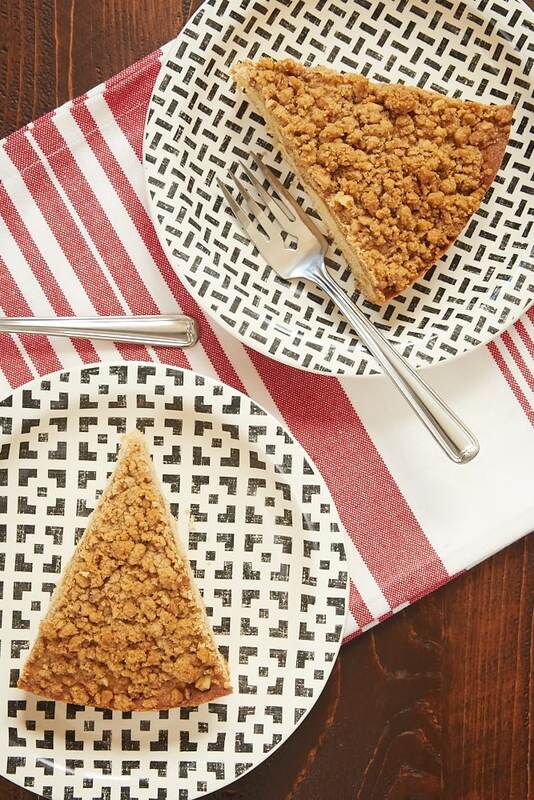 This simple Toffee Pecan Brown Butter Crumb Cake is full of amazing flavor. 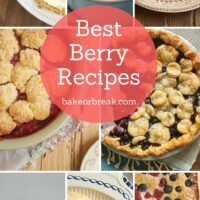 Great for a sweet snack or dessert! Combine the flour, brown sugar, toffee, pecans, cinnamon, and salt in a small bowl. Add the butter and mix with a fork or your fingers until crumbs form. Set aside. 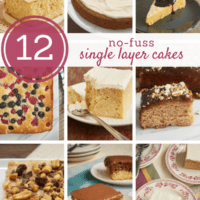 If your kitchen is warm, you may want to refrigerate the topping while you prepare the cake. Place the butter in a medium saucepan. Cook over medium heat until butter melts and begins to foam. Continue cooking, stirring occasionally, until brown specks begin to form at the bottom of the pan and the butter has a nutty aroma. Remove pan from heat and transfer butter to a small mixing bowl. If desired, strain the butter to remove the browned bits. Allow to cool to room temperature. Preheat oven to 350°F. Grease a 9-inch round or 8-inch square baking pan. Add the brown sugar, eggs, and vanilla to the cooled brown butter. 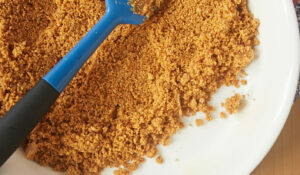 Use an electric mixer on medium-low speed or a wooden spoon to mix until thoroughly combined. Add the flour in 3 portions, alternating with 2 portions of the milk. Mix just until combined. Transfer the batter to the prepared pan. Sprinkle the crumb topping evenly over the top of the batter. Bake 30 to 35 minutes, or until the edges are browned and a pick inserted into the center comes out clean. Cool in pan at least 10 minutes before serving. 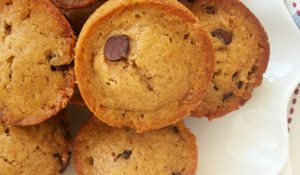 You had me at browned butter! This one sounds great!!! The name of the cake is just a list of mouth watering goodness! Looks incredible, I’d add a cup of fresh brewed coffee into the mix too. I’m fairly certain that only those who are dead inside can resist brown butter. I know I can’t possibly! I adore this flavor combo! Pecans, toffee, and brown butter are a perfect matching and then combining those with the cinnamon sugary goodness of crumb cake….BRILLIANT! 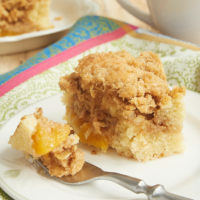 I’m tooling around on a knee scooter after a foot procedure, so yesterday I was happy to see that I had all but one of the ingredients for this crumb cake. I had no toffee chips, but I did have some miniature Heath Bars….these are coated with chocolate. 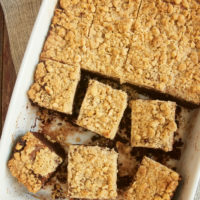 Don’t sue me, but each and every time I make this delicious Crumb Cake, I will continue using “1.75 oz.” of roughly chopped toffee bars. 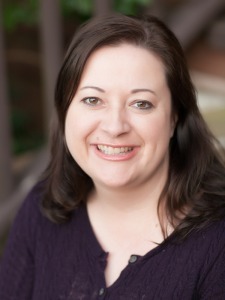 Thank you Jennifer for sharing this recipe. I’m glad you liked it, Jeff! Adding a little chocolate is never a bad idea in my book. 😉 Hope your foot heals quickly!